The New York Islanders are back in the Eastern Conference playoff race. 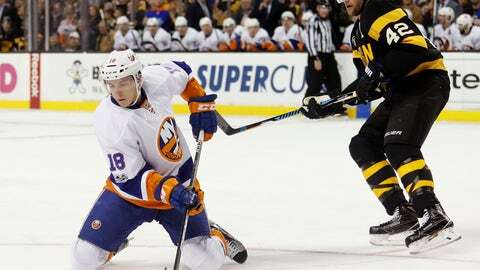 In order to print playoff tickets this Spring, the Islanders will need other forwards to step up beside John Tavares. Front and center on that list is Ryan Strome. Strome is playing to stay on the island. When the New York Islanders drafted Ryan Strome fifth overall in 2011, expectations were high. Garth Snow and the organization thought they were adding another dynamic offensive player to their future core. Strome’s career started off great. In his first full season (2014-15), the 23-year old had an exceptional year producing 17 goals, 50 points, and was a team high +23. However, last year was a big step back for the Ontario native as he only compiled eight goals and 28 points. Last year also included a stint to Bridgeport (Isles AHL affiliate) and a seat in the stands during some of the Islanders playoff games. This season can be described, at best, as an up and down year for Strome. So far this season Strome has seven goals and 15 points. Putting him on pace for 26 points. Strome is coming off his biggest goal of the year, a third-period game-winning goal against the Washington Capitals. If Strome wants to remain with the Islanders long-term more key moments like the other night will be required. If Strome continues to contribute it’s still hard to see the Islanders rejecting a major trade, such as one with the Colorado Avalanche for Matt Duchene because of Ryan’s inclusion in the deal. However, every game between now and the trade deadline is an opportunity for Strome to show the organization he should be considered as a big part of the Islanders future and should not be traded. The Islanders need more proven scoring and with the next wave of forwards coming in Mathew Barzal, Michael Dal Cole, Kiefer Bellows (Anthony Beauvillier is already here) the sands in Strome’s hourglass are running out. No one is expecting Strome to be John Tavares. However, he must be a serious contributor in all three zones on a nightly basis. Consistency has been a problem for Strome. Three stars of the game tonight vs. Washington! Will there be an enticing deal on the table for Garth Snow that includes Strome between now and the trade deadline? Even if Strome isn’t traded at the deadline, if he doesn’t step up his play between now and the end of the Islanders season, there’s a strong possibility he gets moved in the off-season. Strome could be put in a package for the Islanders to land a major player. Another possibility is Strome is sent to the Arizona Coyotes for the talented youngster Anthony Duclair (Duclair having a rough year himself & currently in the AHL). Rumors of Strome being traded to Arizona have been going on since the 2016 draft. Finally, there is the possibility that even if Strome is not traded, he is exposed in the expansion draft. Very easily one could see the Vegas Golden Knights GM George McPhee, taking a chance on Strome. The time is now for Strome to step up and be counted for. Otherwise, he could be wearing another hockey sweater in the near future.